Radium Halos is a based-on-truth fictional account of a woman whose life is irrevocably altered by taking on a summer job at the Radium Dial Company in the 1920s. Stout tells the story through her central character, Helen Meisner, in folksy North Carolinian vernacular. As Helen relates the details of her job training (for painting luminescent numbers onto clock and watch faces) one can’t help but cringe with informed hindsight. After exposure to radium, the results play out like the ticking of a neglected timepiece left to run down. And as if that weren’t enough—a grim event that fateful summer forever binds Helen, her sister and friends in a secret nearly as toxic as the radium itself. Radium Halos reminds us of workers’ conditions, women in particular, during the last century. Shelley Stout knows the ground well: she is acquainted with Leonard Grossman whose father legally represented the women of Radium Dial before Stout’s birth. Her book highlights the type of inequities which drove the struggle for women’s rights; it is upon the ashes of lives such as are represented here that we now stand. So it is, on one hand, a sobering story. Yet Helen’s earthy naiveté, for all its pitfalls, also serves her well. She endures through tragedy and confusion, never expecting much of good or evil, nor ruminating too much on either. Ever the lost child, she merely perseveres, illuminating this poignant story with hope. Oh my gosh. This book is on my to read list. My Grams worked at a similar job just after marriage in around 1919. Luckily she stopped working when she became pregnant w/her first child. Thanks for letting us know about this very interesting and important book about the lives of women who worked in this industry. What a fantastic review. I love how you pointed out that the secret was as toxic as the poison. It is truly the central feature of this book. 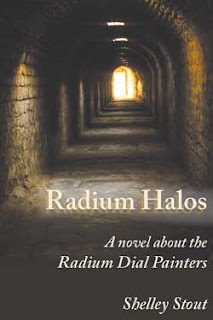 I myself write historical fiction (on sub w/ a NY agency) and I fell in love with RADIUM HALOS when I read it.